In early April, 2011 my wife and fellow aikido practitioner, Tyffany and I joined the Minnesota Aiki Shuren Dojo for their annual spring seminar held at Saint John’s University near St. Cloud. Because of the earthquake and tsunami in Japan in March, Kenichi Shibata Shihan was unable to instruct for the weekend as planned. Shibata Shihan’s hometown and dojo, located in Shiogama were severely damaged. Fortunately Shibata and his family are all safe and well. Mark Larson Sensei trained with Shibata under Morihiro Saito Shihan for close to ten years in the Iwama dojo as kohai (junior student). Though having Shibata Shihan would have been a special treat, Larson Sensei put on an informative and dynamic seminar doing his best to stay true to the teachings of the founder and Saito Shihan. 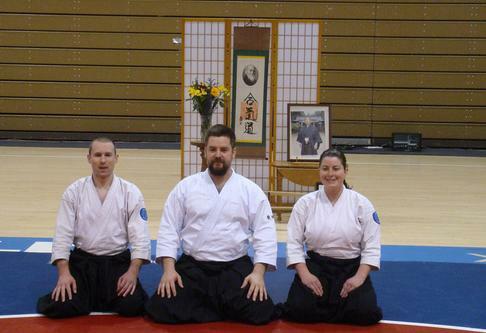 He told us the first day that all proceeds from the seminar would go to help Shibata Shihan and Shiogama. Special relief t-shirts were printed with “Aikido” kanji written by Morihiro Saito Shihan, under which were the names “Minnesota” and “Shiogama” indicating the partnership in aikido between the two locations and students of Saito Shihan. Students traveled to Minnesota from as far as Denmark for the weekend of training. Larson Sensei started off Saturday with some taijutsu (open handed): kata-dori attacks and nikkyo variations. After lunch, the weather was nice enough (rare for spring in Minnesota) to practice kenjutsu (wooden sword) outside on the astroturf football field (I was hanging around the 15th yard line) and work on our suntans. Since no aikido seminar would be complete without a banquet/party/sake-fest, we joined the other attendants on campus for great food and company Saturday night. Shuren Dojo crew for putting on a great weekend and we hope to make the trip next year.